This card was made using a beautiful batik background, a butterfly die from Papertreyink, and a frame die from Elizabeth Craft Designs. Free-motion stitching accentuates the design, and hand-stitched twisted bugle beads and seed beads add a touch of glitz. This card features a sun die from Papertreyink and Memory Box cloud dies. The sun features free-motion swirls in the center, extended out into the rays of the sun. The clouds were cut from sparkly fabric, and "Shine" was die-cut from mirror cardstock with an Echo Park die. Birds flying in the distance were added using a fine-point black Sharpie. These cards feature cupcake dies from The Stamps of Life (Stephanie Barnard's designs), and would make cute birthday cards for somebody special. The "frosting" fabric used for the icing was enhanced with free-motion swirls stitched with matching thread. The white frosting outline was die-cut from white felt and blanket-stitched onto the top. In hindsight, I should have hand-stitched some bugle bead "sprinkles" on top -- next time! This A2-size card (4-1/4" x 5-1/2") features a hummingbird from Dee's Distinctively Dies, with flowers from Elizabeth Craft Designs and "Hello" from Hot Off the Press. The delicate hummingbird is made with two separate fabrics (four die-cut sections) with free-motion stitching added to simulate feathers. A hand-stitched seed bead for the eye and hot-fix crystal for the flower center add dimension and interest. Another blog entry for Elizabeth Craft Designs (May 14, 2017), featuring their new heart dies used as appliques and patterns to make spring ornaments. Or turn them into sachets by adding lavender buds or potpourri when stuffed with fiberfill. Free-motion stitching, hand beading and ribbons completed these keepsakes. This card was created for the Elizabeth Craft Designs blog entry for April 2, 2017, and featured some of their flower, leaf, and frame dies. Free-motion stitching was used for the card insert, with sequins glued on top using glue compatible with fabric. An easel die was used to cut a coordinating cardstock easel that could be included in the envelope so that the recipient can display their little work of art. These coasters were made with a Peltex 4" circle as the foundation (cut using a Spellbinders steel-rule die). Fabric and appliques (dies from Elizabeth Craft Designs) were fused to the top, and enhanced with free-motion stitching. Finally, another iron-on adhesive backed fabric cut with the same circle die was fused to the bottom of the circle, and the edges were satin-stitched. These cute mushrooms were made with a new die set from Elizabeth Craft Designs. Each mushroom consisted of three parts: the stem, the cap, and another piece that was fused over the cap that included small holes cut into the shape, to let the fabric underneath peek through. I used two batik fabrics in shades of browns and eggplant, giving the mushrooms a natural look. The background was a vibrant teal-colored fabric that at first looked too bright, but when another muted batik was used around the borders, the bright teal was toned down a little but still provided a distinct contrast to the mushrooms. Free-motion stitching was done in long, elongated horizontal swirls. The whole scene reminded me of a mama mushroom with her two babies growing under her watchful gaze. A little fungus family! These sunflowers were die-cut with The Radiant Sunflower dies from Simon Says Stamp! There was one die for each part of the flowers in the set (stems, flowers, and flower centers), which made it super easy to put together. Each color was free-motion stitched with matching thread, giving the flowers a subtle textured look. The two flowers together looked like two good friends soaking up the sun on a summer afternoon, which is why I chose the word "friend" for the bottom of the card. Here are three examples of wreath cards I made with dies from Elizabeth Craft Designs. The wreaths and flowers were cut from fabric, free-motion stitched down, and then hot-fix crystals were added to the flower centers. The frames are all die-cut cardstock, as were the bows. The lace heart die is a beautiful new die from Moda Scrap for Elizabeth Craft Designs. The intricate cuts of the die made it very delicate to work with once cut from fabric, but with careful handling I was able to fuse it onto the base fabric, then free-motion stitch it down. The design was enhanced with hand-stitched twisted bugle beads and seed beads. The leaves were cut with a Sizzix die. The feather background paper was from Hot Off the Press. "Love You" words from Elizabeth Craft Designs were cut from pink cardstock. 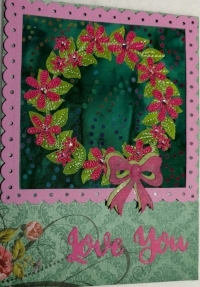 The frame was cut from heavy green paper and made with two dies from Elizabeth Craft Designs: Scalloped Hearts (the largest die in the set) and Fitted Hearts (second from the largest die in the set). This card was made by die-cutting blue fabric with a butterfly die from Papertrey Ink and green fabric with a fern die from Hot Off the Press. The design was free-motion stitched onto a dark green background fabric fused to Peltex, then embellished with twisted bugle beads, seed beads, and hot-fix crystals. The frame (from Elizabeth Craft Designs) was cut from metallic cardstock, as was the word "wish", then glued onto a mottled blue/green paper for this 5"x7" card. A Halloween spider and the tree branch were cut with dies from Elizabeth Craft Designs. The spider is lowering himself by a very narrow silver metallic satin-stitch in front of a moon cut with a circle die, then satin-stitched. Tiny eyes were hand-stitched using seed beads on top of "O" beads. The night sky background fabric is full of silver glitter. A shiny metallic cardstock frame encloses the fabric scene, which is then glued to a card front. Glitter dots are sprinkled around the frame. These flowers were cut from spring-colored fabrics with a Poinsettia die from Elizabeth Craft Designs. The same die was used to cut the leaves from green fabric. They were stitched down using rayon embroidery thread. Hot-fix crystals were applied as the flower centers. This postcard used a background fabric with the barn printed on it; roof tiles were free-motion stitched. I die-cut the sheep and fence using dies from Elizabeth Craft Designs. The trees and grass were dies from Impression Obsession. They were fused onto the fabric, then free-motion stitched using rayon embroidery thread. The flowers were applied using Heat-n-Bond Ultra with no stitching. Tiny hot-fix rhinestones served as the flower centers. The moon was die-cut with a circle die and fused onto the background fabric. The waves were die-cut from two different fabrics (one from the right side of the fabric, and the other from the wrong side to make the waves point in opposite directions) and off-set to simulate a storm at sea. 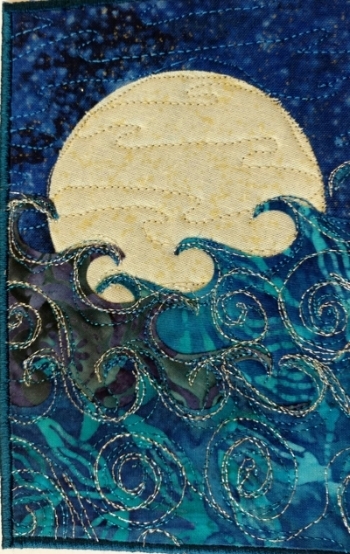 Free-motion stitching (in elongated, horizontal curves on top of the moon, and in large swirls on the waves) was done with regular polyester and metallic threads. This little basket was designed with Electric Quilt 7 (EQ7) software, paper-pieced using a wood-grain fabric, and framed with a cardstock frame. The flowers were die-cut from felt, and the leaves were die-cut from cardstock, with the leaf veins added with a Copic marker. The whole framed piece was raised off the background card using 3M foam tape. This Santa postcard has no die cuts, but I had to include it in this blog because he just turned out so cute! 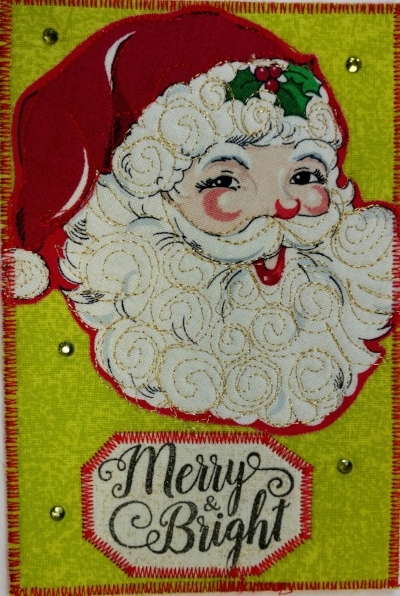 The original fabric was covered with these Santa motifs, so I cut one out and fused it onto the background fabric. Because his beard was blank, it was begging for some free-motion stitching! I used a gold metallic thread and stitched tight curls on his beard and hat. The “Merry and Bright” section was stamped first onto fabric with Versa-Craft ink, cut out and fused to the background, then zig-zagged down. Another paper-pieced block designed with EQ7, framed with a cardstock frame, and set on-point over another square holographic cardstock shape. The center block was raised off the surface with foam tape. The “Love” die cut is cut from a pretty glitter cardstock.